Ilfracombe is a small coastal,cliff and harbour town north of Devon, south west of England, where the famous Hillsborough hill is situated and Hele bay. Ilfracombe is a beautiful relaxing coastal town that I have visited various times. It only has few points of interests but its outstanding scenery and friendly atmosphere is a major reason to visit. Firstly one of Ilfracombe’s main asset is “Capstone Hill” which features centre point of Ilfracombe’s Seaview. Above the huge rock about a three to five minute walk stands a nicely placed British flag and looking back will give you a one of a kind panoramic view of the village. Anyone can walk up this hill but be aware of heights and the steep and sometimes slippery walkways. One for the kids is “Ilfracombe Aquarium” which is a small award winning exhibit which is located in an “Old Lifeboat House” along Ilfracombe’s harbour. The exhibit showcases around 75 different species of sea life found around the area. After the exhibit the aquarium’s café is also a popular place for tourists and locals to relax and chill through the day. 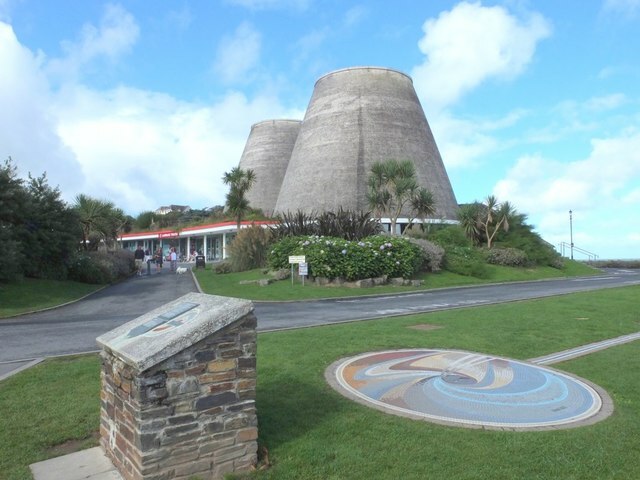 “Ilfracombe Museum” and the “Landmark Theatre” are also popular for tourists and locals a like. Landmark theatre which hosts various events and meetings can fit around 500 seats. Its architecture is unusual consisting of what looks like two overturned buckets which is quiet popular with tourists. “Landmark theatre” replaced the “Pavilion Theatre” a Victorian building destroyed by fire in the 1980. The “Ilfracombe museum” which is located just five minutes left of the theatre is another attraction in Ilfracombe. Housing many collections from Ilfracombe’s rich history from archaeology, art and photography this place is definitely a must for every visitor. Ilfracombe’s newest statue “Verity” is proving to be a highlight attraction for Devon, attracting plenty of customers since its completion. The 20m tall statue built using bronze and stainless steel is a master piece by world renowned sculptor “Damien Hirst”. The statue which is a pregnant lady holding a sword proudly whilst standing on a pile of books. Half of the lady is normal whilst the other half is of her inside organs including the unborn baby. I am not too sure of the story of this statue or what is its meaning but the statue is a sight to see. Minutes away from the statue is the “Chapel of St Nicholas” which dates back to the early 1300s. Through the years the chapel has been used as a lighthouse, laundry, reading room and a place of worship. The chapel is free but donations are also welcomed. Other than these points of interests the town is just a marvellous place to be in.